SOUTH PORTLAND—The Riots powered to an early lead on the visiting Rams in Tuesday evening, June 5’s quarterfinals round, and cruised to victory from there. 8-4 the final. Amelia Pappalardo – formerly a Ram herself – opened the scoring for South Portland just a minute and a half into the action. Kaya Backman followed Pappalardo up with a pair of strikes, and Molly Walker followed Backman up with two more. Finally, with 7:38 remaining in the half, Hailey Morrill put Gorham on the board. The Riots charged onto the field looking equally vigorous to start the downhill stretch, with Paige Fleming adding one and Jena Leckie two. Down 8-1, the Rams dug in their heels and battled: Haley Lowell, Molly Barr and Haley Keeffe all scored as the minutes ticked away. Those three last tallies, however, wouldn’t be enough to save the team, and the buzzer tolled on their season. Faith Dillon added an assist for the Rams, while Fleming added one for the Riots and Madi Cyr added two. 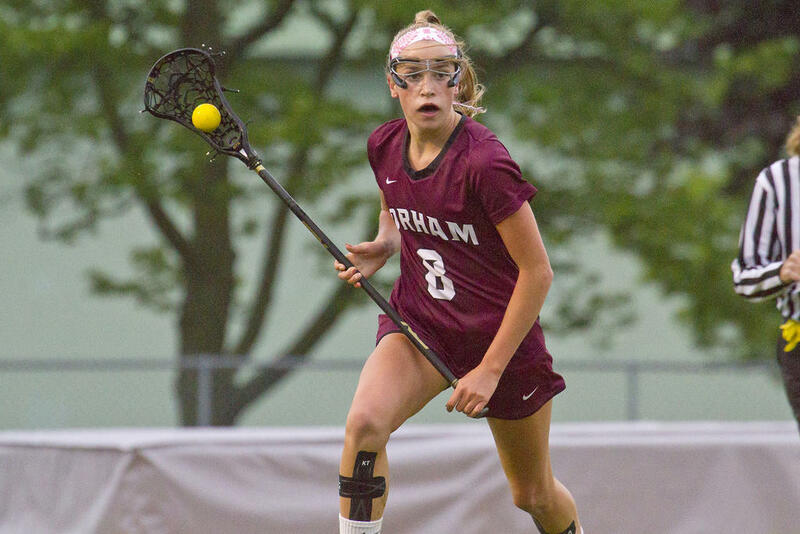 Gorham retires till 2019 at 4-9, having entered the tournament ranked fifth in A South. South Portland moves on to the semifinals; now 6-7, the No. 4 Riots will face off with first-ranked, undefeated Kennebunk on Saturday the 9th. Peyton Morton carries for the Rams. Gorhamite Faith Dillon loses control, harassed by South Portlander Madi Cyr. Gorham’s Gracie Forgues looks to pass. Gorham’s Maddy Sweatt badgers South Portland’s Amelia Pappalardo – herself a former Ram. Hailey Morrill unwinds into a pass.